This cruise in Northeast Australia is a treat, with stops in the tropical northern cities and towns. Leaving from Sydney, the first port of call is Brisbane, gateway to the sunny and glamorous Gold Coast. Scenic cruising at Willis Island is next on the agenda, part of Australia's Coral Sea Islands territory. This little island is a nesting ground for birds and turtles, so keep your eyes peeled! 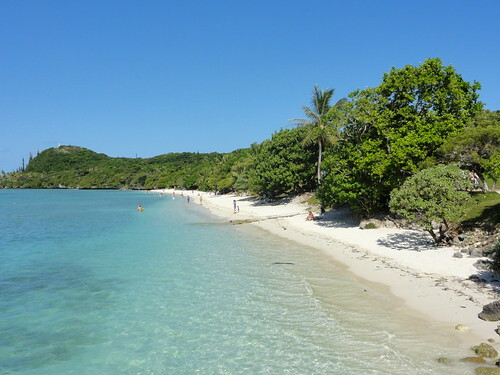 Airlie Beach and the whitsundays come after, and will feel like a south sea island with their white sand. Mingle in the township with tourists, locals and friendly yachties! Townsville is next, a city with a beautiful waterfront area. Climb to the top of Castle Hill for some great views. Port Douglas, gateway to the tropical and fun city of Cairns, is the final stop before the return to Sydney. The Dawn Princess is Australia-based and uses Australian currency, making it simple to get onboard. She is a wonderful ship with plenty to keep you entertained, informed and relaxed! She has no fewer than 4 pools and 5 whirlpool spas, one in the tranquil Adults-Only Sanctuary. There are shuffleboard and sports courts, a spa and gym, the Scholarship@Sea enrichment program with lectures and classes, shopping and kids programs for the little ones. In the evening, there are the bars, lounges and theatres, as well as movies under the stars! Dining onboard happens in one of the two traditional dining rooms, Florentine and Venetian. The Sterling Steakhouse carries a cover charge, but there are other complimentary options- a buffet, pizzeria, grill and room service. See here for great deals on the Queensland cruise in November 2012! The Melbourne Cup is a big one on Australia's calendar- the glamour, the the clothes, the hats, the booze make it an amazing event. Oh, and the horses of course! This cruise focuses on the races as entertainment, and the Pacific Pearl features as an incredible place to stay and be entertained when you've finished watching the cup, as well as transport from Sydney to Melbourne. The ship spends 3 days docked in Melbourne, providing a sumptuous base for your Cup viewing and Vegas-style entertainment each night, so you can put your glad-rags to extra good use! Sailing Dates: Departing Sat, Nov 3 2012, returning Fri Nov 9 2012. The Pearl is up-to-date and full of things to do and places to eat. Your Choice Dining in the fabulous Waterfront main dining room is a treat, or there are casual burgers and chips by the pool, with the buffet nearby. For a small cover charge, chill out with an icecream at the Cafe, or knock your tastebuds' socks off at Luke Mangan's Salt Grill. Entertainment-wise, don't miss the nightly productions in the show lounge to top off your Cup experience. For the sea days, there is the gym, the spa, bars which double as live music venues, pools, rock climbing, mini golf, a casino, shopping and more. Kids can enjoy scavenger hunts, gaming competitions, movies, parties, crafts and other fun activities in 3 different age-grouped kids clubs, and adults can experience total relaxation in luxury sunloungers at Oasis, the adults-only area. See here for great deals on the Melbourne Cup Cruise! Week Fantastique Cruise: 7 - nights in November 2012. Have a week fantastique sailing some idyllic islands in the Pacific. Leave Brisbane and switch to French culture in Noumea. Enjoy the traditional French Boulangeries, Cafes and restaurants or explore the town on Le Petit Train. Many of the sights are quite a distance apart and tours by motor trike, fun car, bike or helicopter offer the best way to see the city. Some great tours are on offer outside of the city, 4WD in the bush, hiking Mount Koghis, Kayaking the Dumbea Rive. Lifou has one of the most diverse landscapes in the South Pacific, from limestone caves to white beaches and coral reefs teeming with brightly coloured marine life. You'll stand awestruck in front of all of its breathtakingly beautiful views: the northern coast of the island is made up of high, steep cliffs, whilst the southern side has pristine white sand beaches with stunning turquoise waters. The substantial dock and port area of Port Vila overlooks a natural harbour. There are beautiful coastal views of the city with its clusters of houses and small scale resorts nestled amongst tropical vegetation makes an attractive scene. The harbour is quite active with fishing boats, yachts and speedboats passing between the various nearby islands. Upon arrival into Port Vila you will have the opportunity to visit many of the local market stalls set up for each ships call into this port. Sailing Dates: Departs: Sat, Nov 3 2012. Arrives: Sat, Nov 10 2012. Pacific Dawn was built by Fincantieri in Trieste, Italy in 1991 as Regal Princess. Her distinctive curved profile—often referred to as 'dolphin-like'—was designed by Renzo Piano. Her sister ship is Crown Princess, now Ocean Village Two. Read more about the Pacific Dawn here! Adriatic Autumn and Italy Cruise: 9 nights in November 2012. Explore the Serene Adriatic and Italian towns on the 9 night cruise aboard the Seabourn Spirit. After exploring the beautiful canal city of Venice, depart for Pula, Croatia. Like the rest of the region, it is known for its mild climate, crystal clear sea, and unspoiled nature. The city has a long tradition of winemaking, fishing, shipbuilding, and tourism. So drink some wine, eat some fish and enjoy this Croatian town. Sibenik lies in the middle of the Croatian Adriatic Coast, at the mouth of the Krka River, one of the most beautiful karst rivers in Croatia. Limestone mountain crests, small valleys and striking plateaus characterize this scenic region. A picturesque town, Sibenik was originally built on a small island, surrounded by a high wall and towers. Walk the city wall in Dubrovnik or just relax in a cafe aside the marbled streets. Kotor, Montenegro is one of the best preserved medieval towns and is home to the overhanging limestone cliffs of Orjen and Lovcen which complete one of the Mediterranean's most beautiful landscapes. Spend a day in Crotone, Italy and experience more Italian culture in Messina, Italy. The rather narrow Straits of Messina separates this triangular-shaped island from the tip of the boot of Italy. Be sure to include some time to sample the delicious food of the region along with some hearty, locally produced wine. Dine on pizza in the place that invented it- Naples. Shop for coral and cameos and be awe struck by the city's splendor and magnificent vistas. End the cruise in Rome, home to the Colosseum, Trevi Fountain and Sistine Chapel. Ports of Call: Venice, Pula, Sibenik, Dubrovnik, Kotor, Brindisi, Crotone, Messina, Napier, Civitavecchia (Rome). Sailing Dates: Departs: Thu, Nov 1 2012. Arrives: Sat, Nov 10 2012. Welcome aboard the Seabourn Spirit cruise ship. Some say a sense of proportion is the true measure of elegance. The intimate size of the Seabourn Spirit assures exclusivity. Aboard these all-suite ships, your fellow guests number no more than 208 well-versed voyagers. The Scandinavian ambiance is inviting; mellow lounges, open-seating restaurants, a spa and a unique marina for swimming are just some of the amenities that enrich your days. Read more about the Seabourn Spirit here! Book the Adriatic Autumn and Italy Cruise here!